A Review of Erie Auto Insurance, Which Policy Options are Available, & are they Cheaper than Their Competitors? If you are in the region where Erie can offer you a policy you may want to consider them next time you are in the market for auto insurance. Erie was founded in 1925 by H.O and F.W. Hirt in Erie, Pennsylvania their headquarters. Recently in the last 25 years they have been added to the Nasdaq Stock Exchange and listed on the Fortune 500. Erie is ranked well in the J.D. Power rating as well as in the national surveys conducted with high marks for the satisfaction of the customers, with 84 out of 100 points. Note: As illustrated, Erie is cheaper than Ameriprise and Farmers by 2% to 4% for a 25 y/o male driver. Only Progressive and USAA are less than Erie’s quote; making them very competitive for young drivers. Among the 2000+ insurers registered in the United States it is the 14th largest. And according to Fortune Magazine it is ranked 382nd among the 500 largest companies in the nation. Nerdwallet has ranked them 3rd as their best car insurance companies. If you are considering Erie for your next auto policy you may want to consider some of the outstanding coverage plans and add-ons they offer. Note: When I queried for quotes for a 25 y/o female driver Erie’s auto insurance quote was more expensive than all carriers illustrated. In this instance they are 12% more expensive than USAA. 1.1 Does Erie have the Cheapest Auto Insurance when Compared with Competitors? With Erie you can not only get the standard liability policy for minimum coverage, comprehensive, and collision, but $500 in coverage for a small family member (a pet) in the event of an injury. Extra options include locksmith services for accidental lockouts. Note: In this instance all of the quotes clustered between $1,095 and $1,238. The only insurer more expensive than Erie is Farmers. Ameriprise and Progressive offered comparable quotes for a 30 y/o female driver. 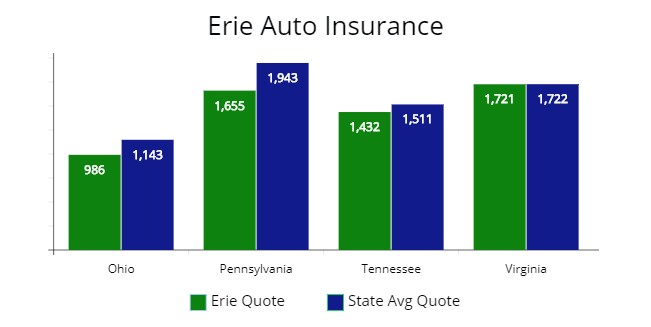 Does Erie have the Cheapest Auto Insurance when Compared with Competitors? When I queried for quotes for each of the carriers and for the driver profile below, Erie was at times cheaper than their competitors and at times they were not. For drivers between 25 to 30 years of age Erie was cheaper than Ameriprise and Farmers. However, Progressive and USAA was cheaper than Erie. For drivers from 40 to 55 years of age Erie was extremely competitive with Progressive, Ameriprise, and Farmers. The only carriers which was cheaper through the whole age spectrum was USAA. Which was to be expected. For drivers with a driving violation Erie was competitive with all of the carriers illustrated with USAA the only insurer cheaper every time. After doing my analysis if you want cheaper auto insurance and you live in a region where they offer coverage then I would certainly put them on your list to get quotes. Another plus is Erie offers Rideshare coverage for those in the Uber or Lyft Rideshare business. For drivers self-employed through Uber or Lyft this is huge. Insurance providers which do not offer Rideshare offer Uber drivers a commercial package. Which can get expensive. Note: A 30 y/o male driver can find cheap quotes with Erie. As illustrated, they are cheaper than Farmers and Ameriprise. However, Erie was more expensive than Progressive and USAA. Only $48 more than Progressive. One of the most appealing features Erie offers is “Rate Lock”. This is a guarantee your premium will not go up unless you add a driver or change your address. If you have an automobile accident or a speeding ticket your rates stay the same. Now that seems to “good to be true” scenario, but realize Erie Rate Lock has a fee. How much will you pay? Well that depends on your driving profile. A young driver could be quite a bit. An older driver? Not so much. Note: The quotes clustered between $914 and $1,032 for a 40 y/o male driver. In this instance, Erie was cheaper than Farmers, but comparable with Progressive and Ameriprise. Is it worth it? A lot of drivers say yes since many have been in an auto accidents and their rates went through the roof. In some states premiums have increased by 10% year over year. If you have Rate Lock you are protected from the yearly increase in rates. There is a caveat with Rate Lock though. If you have a change in address or add a driver, any accidents or driving infractions will be applied to your premium. With Rate Lock you have to plan accordingly to minimize higher expenses in the long run. Below is a table of standard coverage options which are available with Erie. It will cost an extra $30 per year or $150 over five years. If you are claims free the entire time then you have $350 in savings. Since Erie Auto Plus includes a diminishing deductible. Your deductible is reduced by $100 for each consecutive claims–free year, up to a maximum reduction of $500. Note: A 45 y/o female driver can find competitive quotes with Erie. In this instance, they are cheaper than Farmers and Ameriprise. And only $11 more expensive than Progressive. Making Erie competitive for 40-something female drivers. If your vehicle is totaled, Erie will pay up to an additional ten days of transportation expenses for a covered loss after we offer the loss settlement. Your comprehensive or collision deductible is not applied if the accident involves your home insured under an Erie homeowners policy. Erie will pay $1,000 per covered person for death, within one year, due to bodily injury by an auto accident. Note: Quotes clustered between $497 and $576 for a 55 y/o female driver. As illustrated, Erie is competitive for older female drivers and should be considered when shopping for a new policy. Includes emergency travel costs, personal effects, sound equipment and non-owned trailers. First Accident Forgiveness is available for free after three years of accident-free driving with Erie. After 15 years of accident-free driving with Erie, you qualify for Feature 15. Which means you’ll never see a surcharge for an at-fault accident again. In accordance with Erie’s policy, if your car is 2 years old and is totaled, a replacement new car (current model) will take place minus your deductible. According to Erie’s website a new car is considered 2 years or less. And if your new car is in an accident but it’s not a total loss, Erie will pay to repair the vehicle without a deduction for depreciation. And here is what is really cool for older model vehicles. If your car is older than 2 years and is totaled Erie will replace it with a model that is 2 years newer. For example, if you have a 2015 Toyota and it’s totaled then the policy will replace it with a 2017 Toyota. You are able to buy New Auto Security at any time too. If you have a 2012 model vehicle since it was new you could add it to your policy. If the 2012 is totaled you can get it replaced with a 2014 model. Note: When I queried for quotes for all ages it appears Erie is more competitive for male drivers. In this instance, I was offered at quote at $623 making them competitive against all insurers illustrated. If you have purchased comprehensive coverage the basic rental coverage features are included. For example, if you had hail stone put your vehicle out of commission then you would be covered with comprehensive. If you want to have rental coverage when you hit a pole or building then you will have to add rental coverage for the collision portion of your policy for a small fee. Though Erie is one of the top insurance companies in the nation you may have to speak with an agent to finalize your policy. They have streamlined this process. If you decide to get a quote from Erie, once the quote have been sent, the agent will either sell the auto insurance policy in person or over the phone call. In the event you do not want to speak with an agent (some can be pushy) the purchasing process can be confirmed via a text. Note: In the illustration above all of Erie’s quote are cheaper than the state average or median premium cost. Here they are 10% to 19% lower than all 5 states. The average policyholder in the illustrated state probably have a higher premium in they don’t carry Erie. If you are more a hands-on type of person you can go in person to buy a new policy. The agents will provide you the address of the nearest agent and all that is required from you is the filling of application form. In order to discover the amount of policy coverage you require, you will have an opportunity to speak with the agent which will help determine the proper coverage. For you, this is where a little homework is helpful since many agents could sell you more coverage than you need. Discounts are big. At times you can get 30% or more off your premium. When you are talking with an agent be sure to ask about available discounts. Most of them will be applied automatically. Go over your policy to be sure you received all you are qualified for. Erie insurance offers similar standard discount that may be provided by any other large insurance company. Upon purchasing of a premium, this may be applied automatically. Below is a table of the major discounts Erie offers. Which ones their competitor offers and how they stack up against them when it comes of offering discounts. Below is a table of the states which Erie offers coverage in. Which includes the District of Columbia. As of now, they are available in the Mid-Atlantic to the Mid-West states from New York to Wisconsin in the north to North Carolina and Tennessee in the central-southern portion. Note: In the graphic above the only state which Erie was not 8% or lower is Virginia. In Pennsylvania they are 15% lower on average. In the other states, Ohio and Tennessee, Erie is approximately 10% lower. Included in the list is the average rate hike by state. This is a normal amount for company of their type. Erie’s average rate hike versus the past 12 months is approximately 2%. In all instances when I queried for quotes on a state-by-state level Erie was cheaper every time. The majority of the time they were 10% to 15% lower than the median rate within the state. Next time you are looking for an auto insurance policy then you may want to consider Erie’s coverage options. They may be a fit for you and you may find with an a little extra cost Erie could well be worth it. For me I carry USAA right now and if I had to get a quote from another insurer Erie would be on my list. If you are looking for savings you may want to put them on yours too. On 03/03/2018 / Review of Companies / Comments Off on A Review of Erie Auto Insurance, Which Policy Options are Available, & are they Cheaper than Their Competitors?